Super Retina in two sizes — including the largest display ever on an iPhone. Even faster Face ID. The smartest, most powerful chip in a smartphone. And a breakthrough dual-camera system. Available to new and existing customers. Get a -$25 monthly credit for 30 mos. on the 512GB, 256GB or 64GB model w/the UNL+ Data plan. Or, -$16.70 monthly credit for 30 mos. on the 512GB, 256GB, or 64GB model on the UNL Data plan. Our 5 GB Data plan is not applicable for phone discount credits. Other restrictions apply. See store for details. Third-party software sold separately. 1The display has rounded corners. 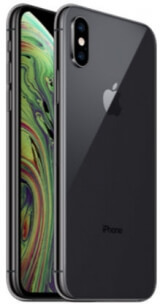 When measured as a rectangle, the iPhone Xs screen is 5.85 inches diagonally. Actual viewable area is less. 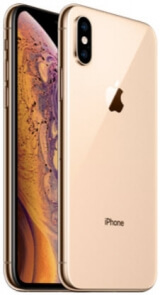 2iPhone Xs is splash, water, and dust resistant and was tested under controlled laboratory conditions with a rating of IP68 under IEC standard 60529 (maximum depth of 2 meters up to 30 minutes). Splash, water, and dust resistance are not permanent conditions, and resistance might decrease as a result of normal wear. Do not attempt to charge a wet iPhone; refer to the user guide for cleaning and drying instructions. Liquid damage not covered under warranty. 3Apple Pay is not available in all markets. For a list of Apple Pay countries and regions, see www.apple.com/ios/feature-availability/#apple-pay. 4Qi wireless chargers sold separately. 5Group FaceTime will be available in iOS 12 later this year through a software update. 6Available space is less and varies due to many factors. A standard configuration uses approximately 10GB to 12GB of space (including iOS and preinstalled apps) depending on the model and settings. Preinstalled apps use about 4GB, and you can delete these apps and restore them.